Low Country Aviation (SC) seems to be the new US Sky Arrow Distributor. They seem to be connected closely with the Italian company, and are attempting to get a US production certificate for the airplane. Their number is 855-435-9522. I found that about a month ago. Before deciding on the Sling2, the Sky Arrow was number one on the list. I flew serial #1 around 1998 or 99, tested it for my agency. I wanted one, but at the time owned a twin Grumman Cougar. Prior to Low Country, their distributor was UA Areo, out of Denver. I could never get them on the line, until I sent an email to the factory in Italy. They were too busy, IMO, selling used jets, helicopters and new Extra aerobatic aircraft, in addition to the Sky Arrow. They sold a nicely equipped SA last summer, which was totaled on a leg of the delivery flight to Florida. It had 41 hours on the Hobbs, very sad. The plane on the Low country website now, N86US, was the other plane that US Aero had on hand. guess Magnaghi owned it and it went to Low Country. I sincerely hope they do well, as the plane is a joy to fly, whether for pleasure or as a work platform, certified or LSA. It excels in all areas. I'm sure Eddie with drop in to offer his first hand experiences, to those who have more detailed questions on the SA. The only thing I don't like about the Sky Arrow is the speed. 86kt is pretty slow for a 100hp, modern LSA. Yes, the Sky Arrow isn't the fastest LSA, but I do get 108 mph / 92 kts TAS all the time on about 5.5 gph. When sight seeing, I often use even less power for lower speeds... it is such a pleasure to fly! I normally see 93-95 kias at 5,200 rpm or close to 100 kias at 5,400 rpm. Still slow, but not that slow. I typically use 4800 rpm on the analog gauge, which shows up as 5150 on the Dynon... (take your pick!) for "high speed cruise". And my fuel consumption in cruise is closer to 5 gph than 6. So... I probably am using less than 75% power. At higher altitudes (which I prefer for going somewhere) the Bing carbs seem to run rich, so speed and fuel consumption seem about the same as near sea level. Higher speeds really aren't much of a priority for me anymore. Been there, done that. Makes me wonder how accurate my analog gauge is! Maybe I should check it. I spoke with them at the new distributor, and they seem friendly and motivated, with plans to assemble Sky Arrows there. I may fly over one day to check out their operation. I love mine, warts and all. What warts? 1) It's heavy. Mine weighs in close to 860 lbs empty weight. I can't imagine new ones are any lighter. 2) It's kinda slow, as has been discussed. 3) Not a lot of fuel @ 18 gals. New ones have more. 4) Engine maintenance and access is a tad more difficult, requiring a ladder and de-cowling for some pretty basic tasks. But the visibility and handling are superb. And overall, very reliable and economical. When I went to log my recent maintenance expenses regarding installing the new fuel pump (about $54 for hose and hose clamps) it was my first maintenance expense for 2018. Total for 2017 was only $514. Of course, some years are a lot more, as in when hose replacement or other scheduled maintenance is due. I have spent about $140 for MOGAS 11 hours or so I've flown so far this year. Can't think of any LSA I'd rather own. If I had to replace it with something else, an RV12 would be high on my list. And it a really cool airplane. When you take your friends up for a ride, escpecially folks without any GA experience, do you get many questions/hesitation perhaps, related to them being “stuck” on their own in the back ? I retract my statement, 100kt is okay. For some reason I thought it was a bit slower. I can say that has simply never come up. Well, maybe once on a Young Eagles flight. A young man had second thoughts on seeing the Sky Arrow. I can’t remember if he did in fact fly in a more “normal” plane that day - Karen might remember*. Worth noting is the back seat is not at all like the back seat of a Cub or Champ or Citabria. In those, you feel like you’re in a cave in the back. In the Sky Arrow the rear seat sits higher than the front, and the wing is far enough back its largely out of view. 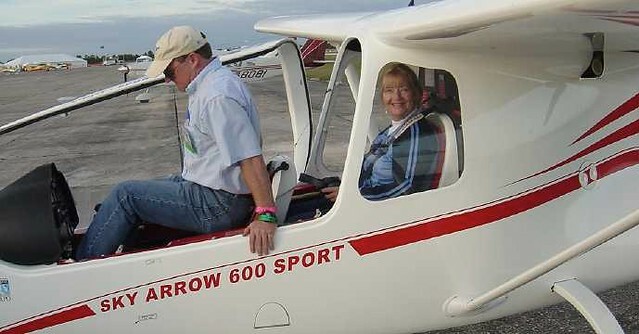 *edited to add: Karen says he was just nervous about flying alone, and went with some other kids in a Bonanza. Last edited by FastEddieB on Tue Apr 24, 2018 8:35 pm, edited 1 time in total. I've flown back there twice. It's fun. Anyway, what keeps amazing me is the total , almost 360 degrees , visibility you get with your sky arrow. Anyway, one last question ... it looks to me like your Arrow is similar to a low wing like Sting or Evektor when it comes to , say an emergency landing on some rough field , and the overall risk of being stuck upside down under this admittedly gorgeous canopy. In case of "rollover" on the ground, the rear windows are easily removable and are considered the emergency exit. In fact, the airplane can be flown with the rear windows removed entirely for photography, etc.